View of “Studio Azzurro,” 2016. For decades now, the Studio Azzurro collective has been a compelling presence on the international art scene, most recently evident in this splendid retrospective of their ambienti sensibili, or sensitive environments. Since 1995, they have maintained a fecund, innovative creative practice, conceiving installations activated by elementary interactions, such as touch or breath. The group’s current show confirms not only the historical importance of the collective’s pioneering oeuvre—which began at the threshold of the era in which we now find ourselves immersed in the virtual—but also the work’s surprising and continued relevance. 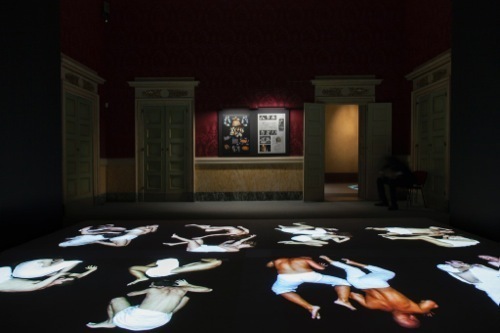 In fact, this exhibition, which unfolds over fourteen rooms, culminates in a new interactive installation, Miracolo a Milano (Miracle in Milan), 2016, created for the occasion, in the Sala delle Cariatidi. Inspired by the celebrated final scene of Vittorio De Sica’s film of the same title, with a screenplay conceived and written by Cesare Zavattini, it is an imagistic reflection on poverty and marginalization. Since 2008, Studio Azzurro have been developing what they call conveyors of stories: an interactive format through which regions are described directly by the people who inhabit them, and whose narratives—activated by the interactions of viewers—are visualized as they develop in real time and through space. The outcome seems to be an anthropologically authentic virtual reality that reconnects technology to profound depths of feeling (as Studio Azzurro have always principally sought to do). The result is the creation of an empathic relationship, shared by those who observe, listen, and—ideally—allow themselves to be transported by these poignant interweavings of space, images, and words.